July 2011. 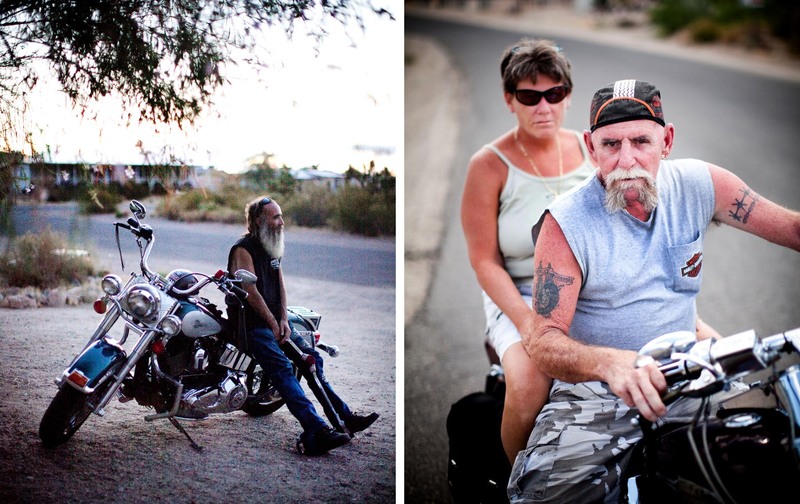 Brotherhood of The Wind/ Motorcycle Road Culture in America. Meadview, Arizona. Since the accident, Tony, 48, wears a chrome and leather leg brace, making his lower limbs seem like extensions of his machine, and his spine is custom-made to fit the Harley. “I didn’t want nothing too stiff,” he remarked, “so before the surgery they put me in the riding position and cast a curve that suited me for my bike. Yeah, man. I guess you could call it a Harley curve.” Last year alone, he put 16,000 miles on his Heritage Soft Tail, weaving his way across America and up and down the coasts in a way that suggested he was looking for all the edges but, without fear or care, they had ceased to exist. He could think of nothing he feared, in fact, except perhaps, his past. After looking at our BMW, he paused, gazed at his bike and threw us the keys. “Give the Harley a try, Man. Ride that thing like you freakin’ stole it.” Piotr Redlinski for The New York Times.